I had a thought the other day that I can't get rid of. I personally think that it's a brilliant idea but maybe it's just me? Bloggers from different backgrounds/topics, be they based in Dublin or elsewhere meet up. We spend the day doing things picked by attendees. For instance, being a beer blogger, I would want to do a beer related thing which is probably go to a pub for a drink or two. A food blogger might want to go to a restaurant. A wine blogger might like to try a wine bar. 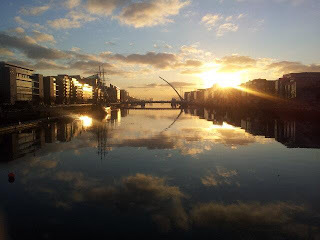 There might be a generic Dublin blogger who knows the city and wants to visit a little known area. Perhaps there is a history blogger who brings us to a historical landmark for some education. Where and what we do depends on how many get involved. The idea then is that we all blog about the day and tweet as we go along. Some might wish to live blog, as in start a blog post and update that post as the day progresses using their phone or laptop. A date/time is picked that suits people. Idea's for places to visit/things to do are decided upon. We all meet up on that date and spend a day together. In terms of numbers, I would say that no more than about a dozen or else we might have problems getting in to some places with capacity issues. If I even got half that number I would consider it a success. Actually, it might be considered a success if more than just me shows up. It would be a great opportunity to do something that you might not ordinarily do. I will contact a few blogs myself and see if they are interested. Here are just some of the blogs that I would hope might be interested. TheBeerNut - Pretty much what I do, though some might say better. The Dublin Diary - General Dublin stuff. Anyone interested in joining, even if you are only visiting then leave a comment below and we can try to work out a date. This is just going to end up being a bunch of us pissheads going on a pub crawl, isn't it? Only if we are the only ones who show up. Excellent. Please mention it yourself on twitter or your blog. I'm going to throw a date out there but I'm open to change. How about Saturday the 6th of July? I can't do the following weekend as I will be in Edinburgh for the Beer Bloggers Conference. Apart from that, my calendar is mostly open. So far I have about 5 interested, myself included. We have beer bloggers, a foodie and a "General Dublin". It would be nice to have some more like a wine buff and perhaps historian on board. I would be well up for it! I'm writing The Garden Glutton about food and gardening but that doesn't mean I want to drag people to the Botanic gardens. Good beer pubcrawl is right up my street! Excellent, keep an eye out for a date and subscribe to this for post for updates. I'm in London that weekend, but don't let my absence stop you. I have dinner reservations at 7pm that evening but free the rest of the day! It seems I can't do the 6th myself so I will come up with another date. How about July the 27th? August gets a little complicated. Never mind the 27th, I have a Beoir camping weekend that's not in my calendar. I'll think of another date, probably in August. This event never got off the ground over the summer. Is anyone interested in doing it before the end of the year? Or scrap it and maybe try again next summer?